It's been a while since I played at Pals Paper Arts, but more crafting time is definitely one of the delights of the holidays. This colour challenge was a stretcher for me, as I don't use Wisteria Wonder much, although I confess to a recent fling with Night of Navy. Over the last few months, I've done quite a lot of experimenting with different backgrounds, even though my natural inclination is to lots of white space. I've been wanting to use this embossed background for a while, so after experimenting with the three colours and making a number of panels, I chose to use this decorative panel as the starting place for the card. I inked the Beautifully Baroque embossing folder with Wisteria Wonder, then embossed a piece of white card. Then I used a blending tool to add more Wisteria, followed by sponging on Night of Navy. Finally, I brushed Versamark over the top and embossed with silver. As I'd used the Beautifully Baroque folder, I used the Beautifully Baroque background stamp to lay a ground for the panel. I feel that the butterfly punches I bought have more than paid for themselves as I love to use the Papillon Potpourri stamps, although on this occasion I've used the butterflies from Kinda Eclectic. I've stamped them onto Night of Navy and embossed them with silver, although the base butterflies underneath are plain navy. The Wisteria Wonder candy dots and brad base finished them off. I was wishing I had silver baker's twine but settled for spraying a piece of linen twine with Perfect Pearls and, although it hasn't photographed so well, this worked a treat. Stamps: Beautifully Baroque, Kinda Eclectic, sentiment from Vintage Labels. Other: Beautifully Baroque embossing folder, Corner Rounder, Butterfly punches, silver embossing powder, Brad base, Wisteria Wonder candy dots, Linen twine, Perfect Pearls, Silver organza ribbon, sponge, distressing tool. 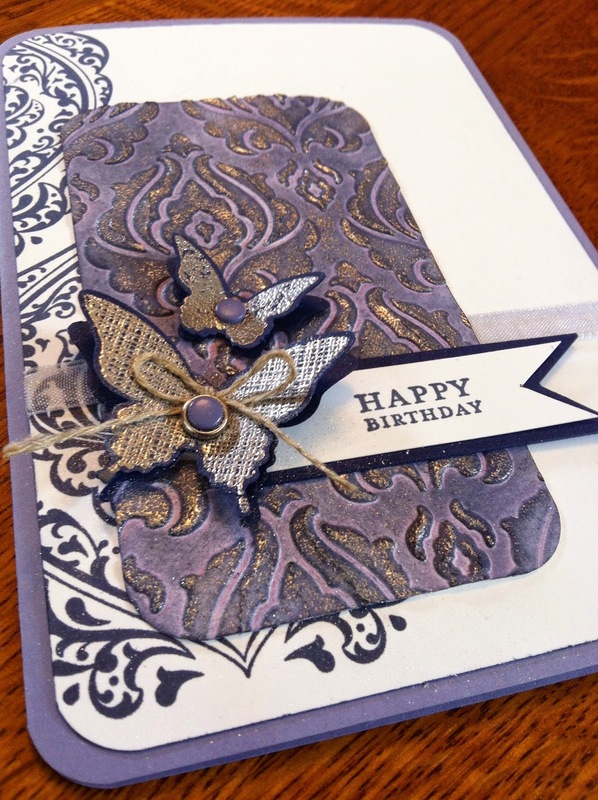 Wow what a gorgeous effect with embossing and ink! And the butterflies are beautiful! Thanks for joining us at PPA! Beautiful embossing!! What a fun card, Jan. Thanks for playing at PPA! Very pretty! Thanks for having fun with the PALS this week!